So I brought my first roll of Holga film in to the lab today, the only lab around that I knew could process 120mm film, and it turns out that they can only do color film, and my roll was black and white. But they gave me the name and number for a place that can do b&w, and they sell color 120 there too, which is what I was looking for to begin with. 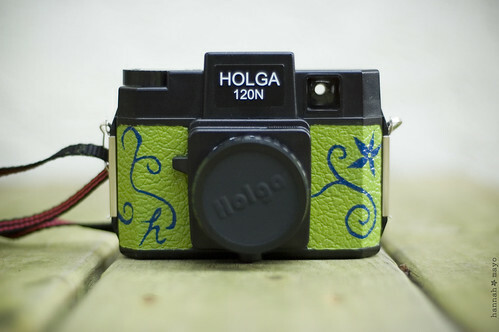 Anyway, no pictures from the Holga yet. I am just itching to see how they turn out... My friend Jami (who is an awesome, beautiful, creative mama and blogger) shared this idea with me, from a blog I happen to read already and enjoy (but I'd never seen this post before), and I immediately decided to go for it. I was in the mood to paint something and I had everything I needed already. I love how it turned out. 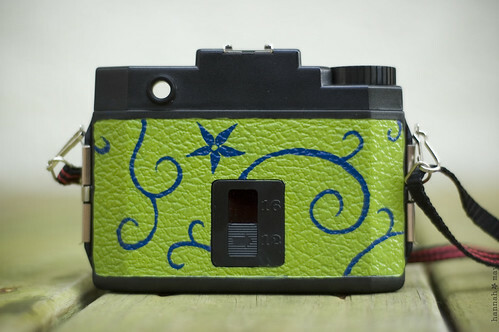 I love that this camera is inexpensive enough that I would do something like this with it. We're flying to Massachusetts at 8am tomorrow, a much needed vacation and a chance to see some family (who haven't even met Seth yet!) There is supposed to be snow, which will be exciting for us southeasters. I've been packing and preparing all evening. I may blog from there, but if not I'll be back on the 27th, and with plenty of pictures I'm sure. Snowy white pictures.